I try very hard to maintain a professional unbias when reviewing albums, but occasionally something will strike a nerve, and I will descend into either unabashed praise or flaming hatred – both equally unprofessional. 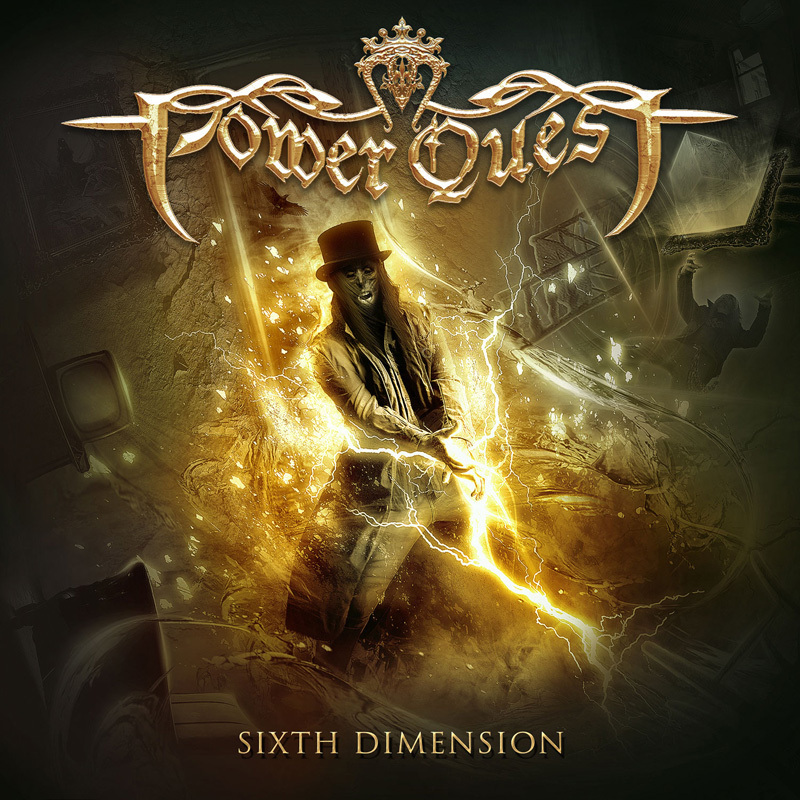 UK metallers Power Quest are of the former variety, constantly enticing me with their brand of ultra-happy, ’80s-influenced, synth-heavy power metal. I’ve already used the phrase ‘most anticipated album of the year’ in 2017 about five times – but here, I truly mean it. After the tragedy of the band splitting up due to financial issues back in 2013, they executed an enormously successful comeback with a terrific EP (Face The Raven), a slew of amazing shows, and some quite generous packages for fans to purchase. Needless to say, they set the stage for a new full-length perfectly. The magic has been truly revived, the Quest is going on as planned, and Steve Williams should be very proud of The Sixth Dimension indeed. After a minor setback involving the departure of guitar duo Gav and Dan Owen, the band picked themselves up spectacularly to soldier on with Andrew Kopczyk (from I Am I), and fellow Welshman Glyn Williams. Vocal duties are still being handled by the incredible Ashley Edison who, along with his other, heavier band, Dendera (check out their new EP, by the way – it’s brutal!) is proving to be one of the most versatile clean vocalists in modern metal. His gruff edge on tracks like “Face The Raven” makes the silky smoothness on “No More Heroes” even more luscious by contrast – and that’s before hearing his phenomenal falsetto athletics on “Revolution Fighters”. Main man Steve Williams is also on fire with his keyboard performance. As soon as that synth in the opening riff of first track “Lords Of Tomorrow” gaily bounces around, any fan will instantly recognize this as the Power Quest we know and love. He also pulls off some spectacular key flourishes in the opening of “Revolution Fighters” and the super-cool section after the first chorus of “Face The Raven”. Williams’s songwriting prowess has not dimmed one iota. The Sixth Dimension most resembles 2008’s Master Of Illusion in terms of atmosphere and song structure, but cleaner and better executed. Sections flow from one to the other seamlessly, always using a lick or crescendo so as never to lose the momentum. Listen to how the guitars nimbly scale up into each chorus of “Pray For The Day” – that’s detail not worth ignoring. Vocal harmonies and choirs are, as usual, spot on. In fact, a few fans were granted the opportunity to join the band in the studio to record backing vocals for a few tracks – including a very close friend of mine whom I might never forgive *insert angry face here*. Joking aside, that sense of community and dedication to one’s fanbase is incredibly admirable and should never be swept under the carpet. In case you’re reading, Steve, us fans seriously appreciate that extra mile you go! The Sixth Dimension contains all the traditional Power Quest tropes one would hope for: the catchy choruses, the female vocalist guest spot, the ’80s stadium rock synth timbre, the token love song (“Pray For The Day”), and of course, the lengthy closing title-track. Despite never reaching the frantic velocity the Brits are capable of, this nine-minute sprawler is equally mysterious and dramatic thanks to both its theatrical chorus and haunting piano that fades into audible mist. The high-speed Euro-power anthems exist in the shape of “Coming Home” and the almost comically generic “Kings & Glory”. The former is a sequel to 2003’s “Sacred Land” containing similarly jaunty melodies and references to older PQ tunes. The latter is a vibrant and animated power metal hymn absolutely begging to be played live! This LP is wonderfully structured, every track building on the momentum of the last, but providing something totally different. The pedal is pushed firmly to the metal on the riff-centric and hard-hitting “Face The Raven”, but the atmosphere is stripped back to reveal a more tender, yet still energetic, feel on “No More Heroes”. This kind of variety is what makes the replay value 100%. I would label this as ‘comeback of the year’, but if we’re being perfectly honest, Power Quest have never dipped in quality enough to warrant the need for a ‘comeback’. This is more of a triumphant return to the peak of the UK power metal scene, where they deserve to be. Upon further listening, I’ve concluded that this review is not biased, The Sixth Dimension is simply an amazing slab of British power metal that begs to be heard by any fan of the genre. The magic never really died, and the Quest must indeed go on! This entry was posted in Bands, Power Metal, Reviews and tagged Ashley Edison, British power metal, Dendera, England, I Am I, inner wound, inner wound recordings, keyboard, Power Quest, Steve Williams, synth, The Sixth Dimension, UK, UK power metal, Wales.